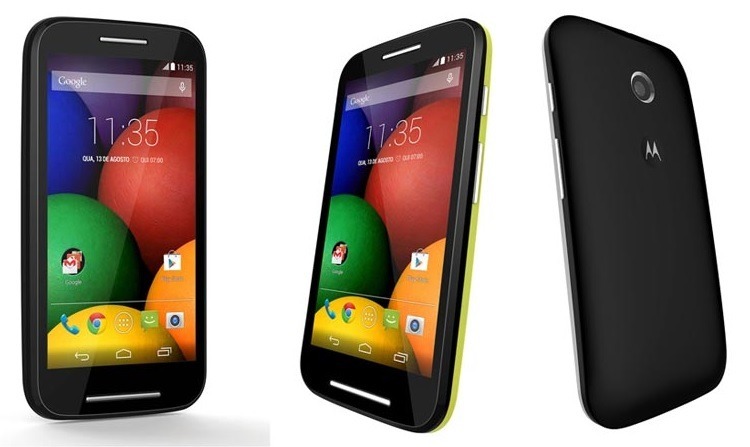 The Motorola Moto E smartphone is official, with a price tag that easily surprises everyone, as the pricing set for the Indian market is Rs. 6999, while that in the European market is 89 Euros, and at this price point, the Moto E is a brilliant budget device, which can beat any other smartphone in the competition. The phone is now also available in the US (pre-order right now), and the price is set at $129. The first market which should get the Moto E is India, thanks to the success of Moto G and Moto X. As the launch date is near, we are hearing a lot more and getting more leaked details about the upcoming budget smartphone from Motorola – the Moto E. This smartphone was listed in an online store “Fast Shop”, where the specs and press shots were leaked. The Motorola Moto E was a name rumored till now, but it’s being confirmed through one of the shipments sent in India, with over a thousand devices being shipped, and the name being clearly mentioned as “Motorola Moto E White”, it’s not limited to rumors now. To excite many who were expecting this to be a device in the budget range, the smartphone was given a price value of Rs. 6,330 although it could be a little higher during the launch, but still, this is a budget phone coming from a brand which has offered quality products in the recent past. 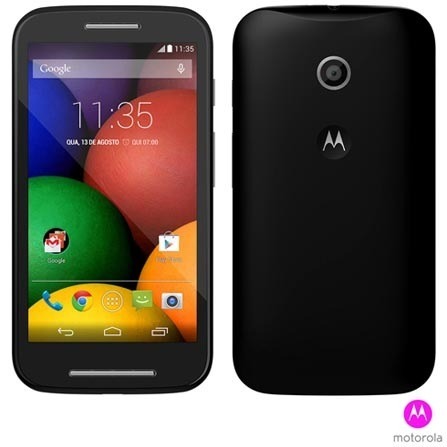 If there is a company which is bringing out the best products at a price which the mass can afford, it is Motorola. 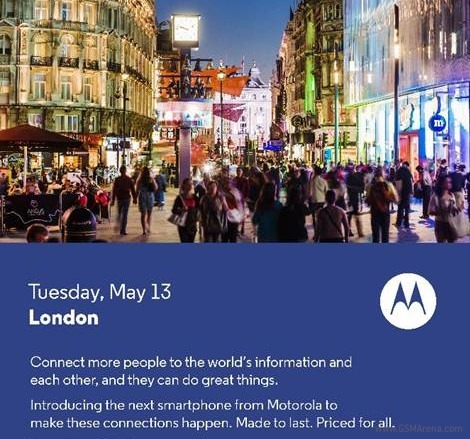 And after the success of the Moto G and Moto X in the several markets, the company is coming up with yet another device, and they have sent the invites for the event to be held on May 13th. Recently, there has been a lot of talk about two upcoming devices from Motorola, the Moto X+1 and the Moto E. Going by the text in the invite, it probably is the Moto E which is going to come into the scene. The Moto E is rumored to be Ultra cheap, and the “Priced for All” could also suggest that there might be some variants coming in, but the entire focus would be on the cheaper one, especially because there is a scarce of good quality products in the budget range. 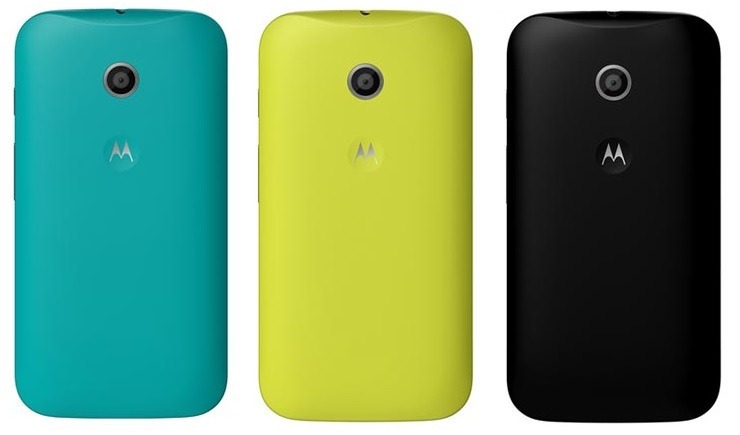 The Moto E is rumored to have a 4.3-inch display with the 720p HD resolution, and there is a dual-core processor clocking at 1.2 GHz and 1GB of RAM, and just like in the Moto G, there is a 5MP camera on the rear camera. The battery is rumored to have a capacity of 1900 mAh but the issue could be with the internal storage of 4GB as there is no indication whether there is an option to expand the storage with the MicroSD card or not, and we hope this gets the card slot, unlike the previous devices Moto G and Moto X which had the fixed internal storage and no option to expand it. The event is going to be held in UK, and as the Moto G and X are already being sold there, this is a new handset coming in the market very soon. The other phone from Motorola, i.e. the Moto X+1 is also rumored to be coming later this year, and this one would be something in the mid-range, thus we are expecting only the Moto E this month. Just like LG is holding the event for the G3 on May 27th, we expect the smartwatch from the company on the same day, but for that, there was a slight indication with the letter “G” in the invite text, while there is no such thing in the invite from Motorola, but who knows, there could be a sudden surprise from the company if they decide to announce the Moto 360 smartwatch all of a sudden. But again, if you are someone digging into the details, the invite would show you a clock and the word “connecting” could be even more than the smartphone. Let’s wait and hope for Motorola to come up with something exciting, and we would be happy even if it is just a smartphone, as Motorola has made a habit of impressing (except for the early pricing of Moto X, which then got reduced to something in an affordable range) people. 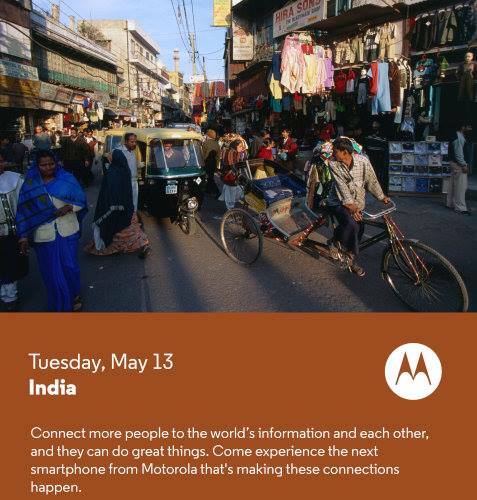 Update: Motorola has sent an invite even for the event to be held in India.